Hoop it up! 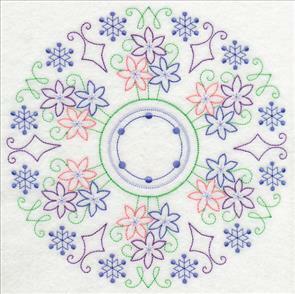 This week's fabulous new designs have been specially digitized to fit in a circular shape, making them terrific for displaying in hand embroidery hoops (and other projects, too!). 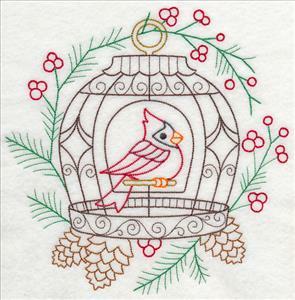 Frame a vintage-style birdcage or winter flower motif in a hand embroidery hoop, use beautiful, intricate flourishes to make sun catchers, or create a collection of wall art with new snowy winter scenes. 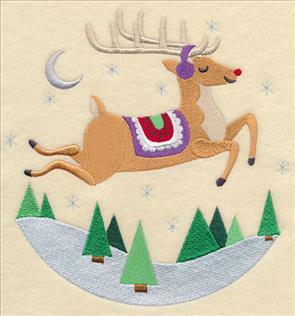 Plus, pillows and tote bags get a fun update when adorned with chalkboard greetings, and woodland winter animal circles are fabulous on mini-quilts and wall hangings. 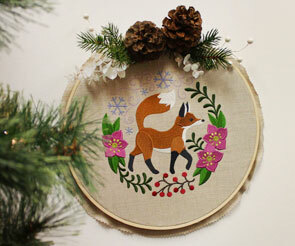 Get creative with hand embroidery hoops! 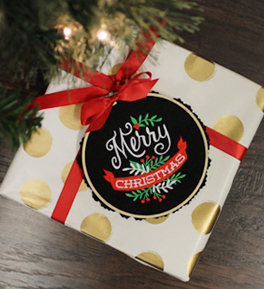 Here, a small size has been used as a gift tag on a Christmas present. 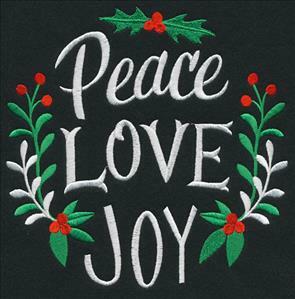 Spread the peace, love, and joy of the holidays with a cheerful chalkboard-inspired design! 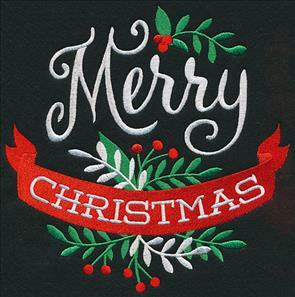 These greetings of the season are stitched in a brilliant white with pops of color. Add them to pillow fronts, fabric gift bags, or on an apron. 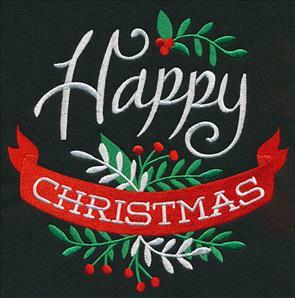 7.81" x 7.75" and 6.90" x 6.85"
5.94" x 5.86" and 4.92" x 4.86"
Wish friends and loved ones a "Merry" or "Happy" Christmas with these colorful holiday sayings. 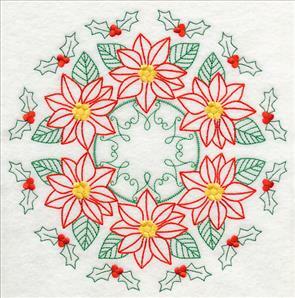 Holly and berries and a brilliant red ribbon add extra festive spirit to the designs. 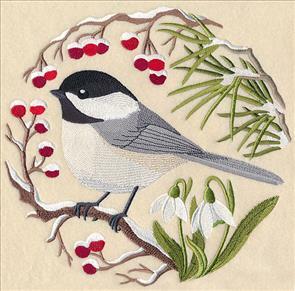 7.81" x 7.71" and 6.94" x 6.85"
Beautiful winter birds -- a cardinal, chickadee, and blue jay -- are surrounded by winter flowers and foliage covered in fresh, white snow. These woodland circles coordinate with our other wild bird scenes. 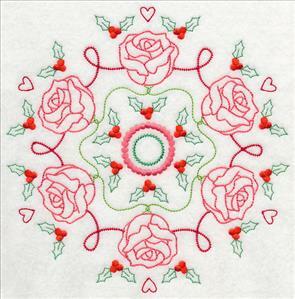 Stitch them all on a quilt, or as a series of framed embroidery hoops! 8.62" x 8.60" and 7.79" x 7.77"
6.88" x 6.86" and 5.88" x 5.86"
8.59" x 8.60" and 7.80" x 7.80"
6.90" x 6.90" and 5.86" x 5.87"
Light, blank fabric gives these winter birds on branches a place to shine. All three of the birds are non-migratory birds, and are breathtaking to see sitting in winter's snowy backyards. 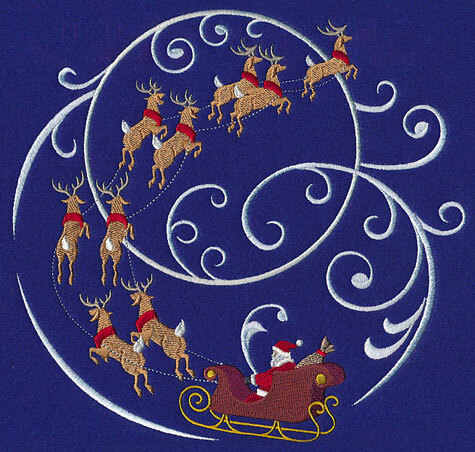 8.59" x 8.60" and 7.79" x 7.80" and 6.89" x 6.90" and 5.85" x 5.86" and 4.85" x 4.86"
Santa and his team take off on a midnight ride to deliver toys and gifts to the little girls and boys around the world. 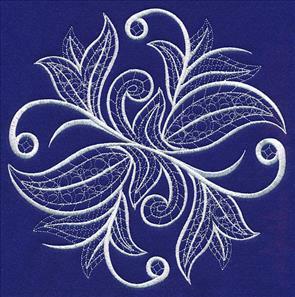 Filigree swirls add elegance to the holiday design -- stitch on pillows, wall hangings, or framed pieces. 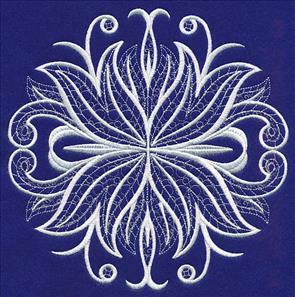 8.78" x 8.57" and 7.80" x 7.62"
7.02" x 6.86" and 5.95" x 5.82"
Showcase your favorite hoop-shaped embroidery on another circular space, such as the front of our All-Around Accent Pillow. 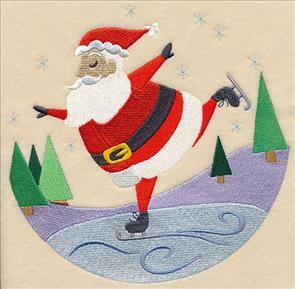 It's the perfect place for showcasing these festive hoopla designs! Click here for the free project tutorial. 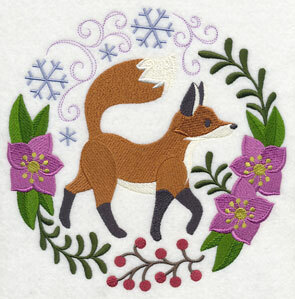 Swirling snowflakes, flowers, and other greenery wreath these woodland animals in the whimsy of winter. 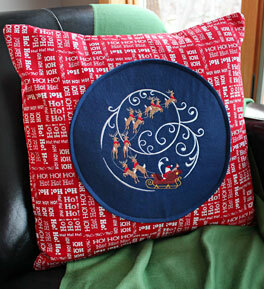 Stitch them onto light fabrics to frame in hand embroidery hoops, or on pillows, totes, and more. 7.79" x 7.81" and 6.87" x 6.88"
5.86" x 5.87" and 4.82" x 4.83"
7.72" x 7.79" and 6.88" x 6.95"
5.87" x 5.92" and 4.86" x 4.90"
Frame your favorite design in a hand embroidery hoop and hang it on a wall or off a mantel for a fun addition to your home decor. 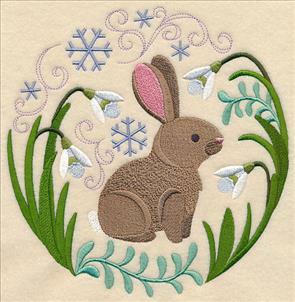 To get inspired for other ways to use designs with a hand embroidery hoop, check out our projects using the classic crafting material here. 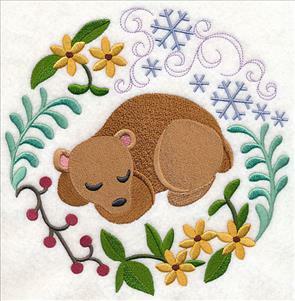 Each of the too-cute animals in these circular designs is a charming addition to a quilt, series of framed pieces, or on kids' gear. Pick the colors of the snowflakes and other accents to match your color scheme, or your home decor. 7.72" x 7.78" and 6.88" x 6.93"
5.88" x 5.92" and 4.88" x 4.92"
5.87" x 5.87" and 4.85" x 4.85"
A furry bunny and sleeping bear finish this group of fanciful winter woodland friends. 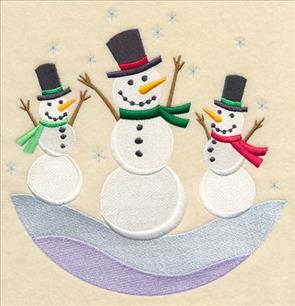 Stitch the snowy sweeties on your next embroidery project! 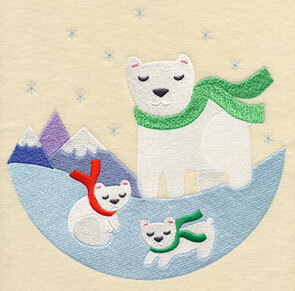 7.64" x 7.78" and 6.89" x 7.02"
5.87" x 5.97" and 4.87" x 4.95"
7.76" x 7.78" and 6.89" x 6.89"
Pick your favorite winter wonderland animal by using the individual links above, or buy them all at a discounted price by purchasing a design pack! 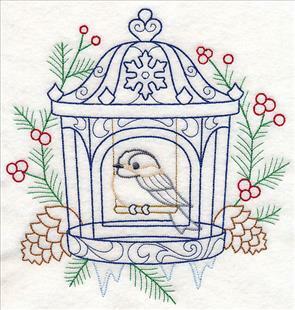 A quick-stitching cardinal and chickadee spend their days in these gorgeous winter birdcages. Embroidery hoops made with natural wood are the perfect accompaniment for these vintage-stitch designs! 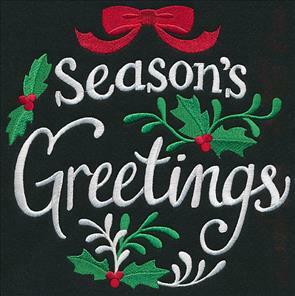 5.86" x 5.92" and 4.87" x 4.92"
7.51" x 7.81" and 6.90" x 7.18"
5.86" x 6.10" and 4.87" x 5.06"
A pair of Christmas blooms (poinsettias and roses) are stitched in the stunning vintage style. Vintage designs are light and open, and are a perfect fit for smooth neutral fabrics. 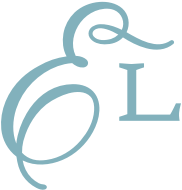 We particularly recommend quilter's cotton, linen, tea towels, denim, canvas, and similar fabrics. 7.80" x 7.80" and 6.85" x 6.86"
Snowdrops and crocuses offer a winter alternative to the holiday flowers above. Each of these beautiful designs uses a delightful sense of symmetry and a delightful color scheme to impart even more beauty into the vintage style. 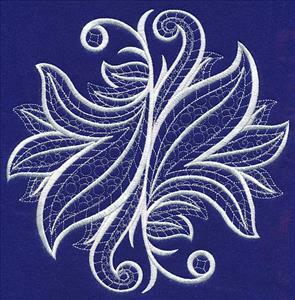 Add a lacy appeal to your embroidery projects with these gorgeous whitework flourishes. 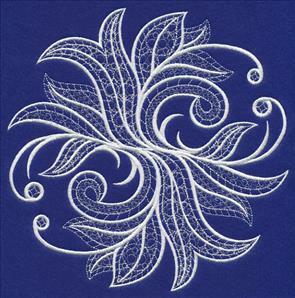 Light, intricate stitches fill the open spaces with a lace-like look, but the designs are not actually freestanding lace -- you can stitch them directly onto apparel, blankets, and linens! 7.79" x 7.74" and 6.93" x 6.88"
5.87" x 5.85" and 4.88" x 4.85"
Stitched on organza and hung in hand embroidery hoops, these lovely designs are beautiful on sun catchers. 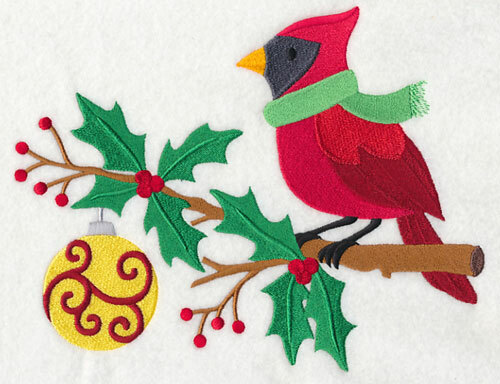 Hang in front of a window, or on a tree outdoors to display your homemade masterpiece! 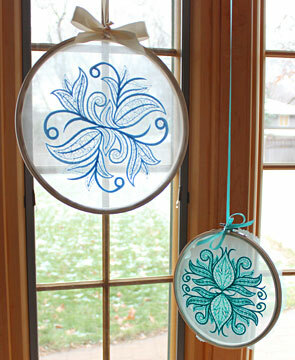 Learn how to make these sun catchers here. 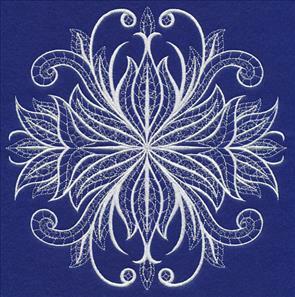 The whitework style gives these motifs a wintery, snowy look, but you can use a variety of colors to match your home decor, or stitch in white for a wintery look. Or, stitch in metallic thread for a shimmering look! 7.79" x 7.74" and 6.90" x 6.85"
7.67" x 7.78" and 6.82" x 6.92"
5.76" x 5.84" and 4.86" x 4.93"
The detailed and elegant look of these flourishes lets you add a delicate finish to any embroidery project! Use rich, sophisticated fabric to match the beauty of the flourishes, or stitch on denim or canvas for a beautiful contrast. 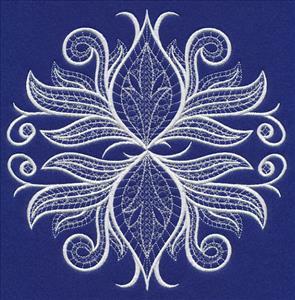 7.77" x 7.75" and 6.87" x 6.85"
5.87" x 5.84" and 4.87" x 4.84"
Get all six of the whitework flourishes in a design pack at a fabulous discounted price! 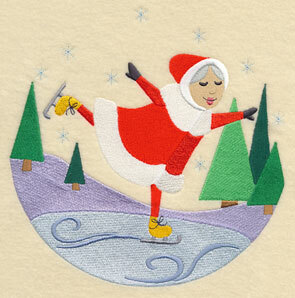 Santa and Mrs. Claus have strapped on their skates and are gliding over the frozen ice in these wintery scenes. 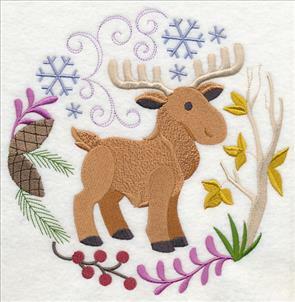 Frame them side by side in a pair of embroidery hoops, and hang in your home this Christmas season. 7.71" x 7.70" and 6.82" x 6.82"
5.81" x 5.80" and 4.80" x 4.80"
7.65" x 7.61" and 6.77" x 6.74"
5.76" x 5.73" and 4.76" x 4.74"
Rudolph frolics across the snowy forest in this whimsical design; a trio of friendly snowmen celebrate the season. 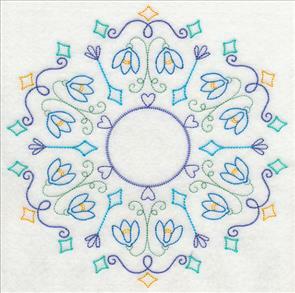 Pick your favorite scene to stitch alone, or use them all in a quilt or series of framed hoops! 7.36" x 7.60" and 6.52" x 6.72"
5.55" x 5.72" and 4.58" x 4.73"
7.38" x 7.64" and 6.53" x 6.76"
5.56" x 5.76" and 4.60" x 4.76"
A polar bear watches over its cubs and makes a sweet addition to kids' gear, pillows, and totes. 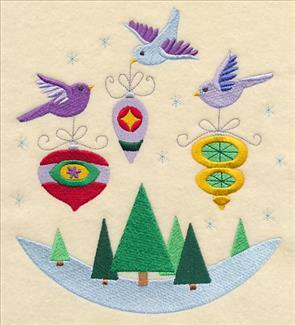 Three sweet birdies carry ornaments to their Christmas tree. 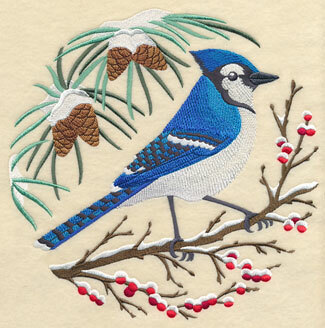 Terrific on tree skirts, wall hangings, tea towels, and more! 7.77" x 7.70" and 6.88" x 6.81"
5.85" x 5.80" and 4.83" x 4.79"
6.82" x 7.66" and 6.03" x 6.78"
5.13" x 5.78" and 4.24" x 4.78"
Get all of the wintery scenes to decorate your home this season. They're all available in a design pack. 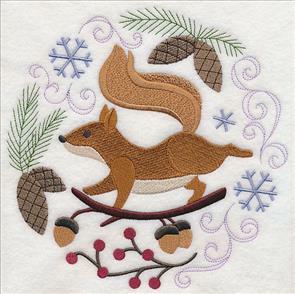 Connie liked the Country Summer and Country Squirrel in Autumn designs, and asked for more different seasons and occasions. 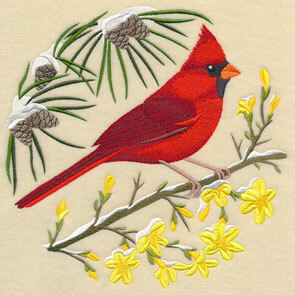 We thought a sweet cardinal in this style would be a very merry addition to our growing collection of Christmas designs! 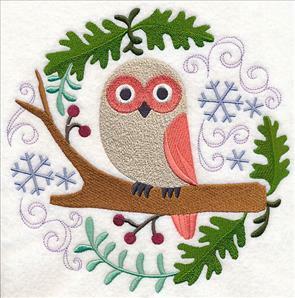 This sweet bird is wrapped up in a scarf to stay warm for winter, and perches on a colorful branch alongside an ornament. Thanks for the suggestion, Connie! 8.90" x 6.90" and 7.54" x 5.86" and 6.26" x 4.86" and 3.86" x 2.99"